Children living in poverty frequently enter kindergarten lacking critical cognitive, academic, and social-emotional skills, and this gap predictably widens throughout K-12. Several researchers have developed intervention programs intended to close the academic gap by building foundational curricular skills. These interventions may not be the most efficacious methods to address student needs. Given recent efforts to establish early childhood education standards and the implicit push to close the school readiness and achievement gap, it is important to identify research-based interventions for practitioners and decision-makers. The purpose of this systematic review of empirical literature, reduced from 97 to 3 articles, was to identify research related to specific pedagogical and instructional approaches used to impact poverty’s effects on elementary children’s academic performance. 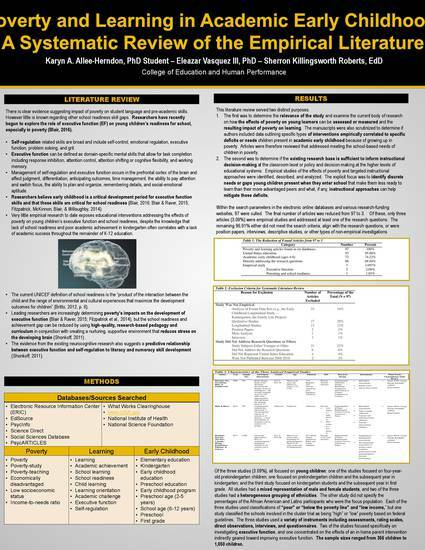 This poster was also presented at the College of Education and Human Performance Graduate Research Showcase on March 7, 2017 and won 3rd place.